Welcome to the May's Bridal & Fashion news and tips for making the most of your special day, how to get the perfect Wedding Dress in Palmerston North as well as other special occasions. After the wedding dress, bridesmaids dresses are one of the most important parts of your wedding plans. It can be a tough job, especially if you have a number of bridesmaids, to find dresses that fit everyone’s style and body shape. Here are some tips for Bridesmaids dresses. Increasingly the trend is to choose different styles of dress for each bridesmaid. Each bridesmaid selects a dress that suits their individual style. Rather than making them conform to one type. 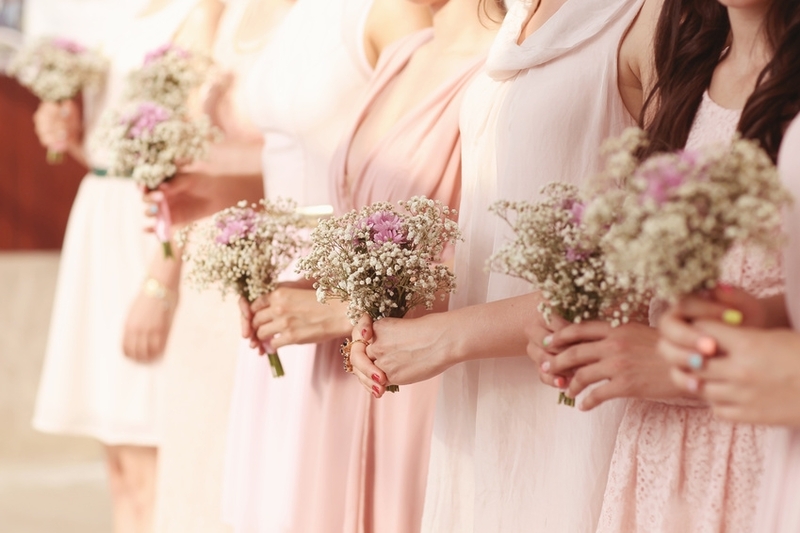 Choosing different styles for each bridesmaid means you need to think carefully about how you will tie the look of your bridal party together. Colour: Even though the styles of your bridesmaid dresses might be different, you can still present a united look by making them all the same colour. Or perhaps use a range of shades of one colour to add interest but keep continuity. Accessories: Dress styles may need to differ for different people. Accessories, however, are more likely to fit everyone. You can pick fascinators, hairstyles, jewellery or shoes that all match. Use your dress as a base: To create cohesion between your look and your bridesmaids, you could think about incorporating details from your wedding dress into the bridesmaid’s outfits. Perhaps use the same material to tie the bouquets. Or you could create detailing on headpieces for the bridesmaids. Using the same style of detailing on all the dresses is another option. Limit choices: You might be happy to give your bridesmaids different styles. But letting everyone choose whatever they like may be a step too far. You could pick two or three styles that suit different tastes and let your girls choose from there. If you are planning on making your bridesmaids dresses individual, you might want to consider approaching a proper seamstress to either create custom made dresses for you and your bridesmaids. Or having a seamstress make professional alterations to off the rack dresses, so each one fits perfectly. If you are planning to use parts of your wedding dress to create accessories or details for your bridesmaid’s dresses, a dressmaker can also ensure everything matches correctly. While most people tend to think about booking a summer wedding, choosing an out of season wedding in winter can have lots of advantages including the following. more availability for venues during the low season. potential of getting a venue and other services cheaper because they are in less demand. the possibility of tying your wedding in with a special date such as an anniversary or midwinter celebration. Choose a long sleeved dress – most wedding dresses these days are strapless or have only thin straps, but a cooler wedding allows you to play with sleeves, such as delicate lace sleeves or cap sleeves in the same material as your dress. Go for colour – having a winter wedding can be a great excuse to thing differently and opt for colour rather than a more traditional white wedding dress. Pick a rich seasonal colour such as red or green, or add some glitz with glitter or gold or silver accents. Think about materials – winter could be a chance to try something different with a heavier material like velvet. Accessorise wisely – as the weather might not be as reliable out of season, you need to think carefully about accessories for your winter wedding dress. Perhaps opt for boots rather than shoes, or think about adding a wrap, gloves or hand muffler so you can keep warm during photos but take off layers at an indoor reception. Whatever you decide for your winter wedding dress, it is important to still enlist the help of a professional fitter. They can ensure your dress fits in all the right places and that you are choosing a style that flatters your body shape. Just got engaged? What about a winter wedding? 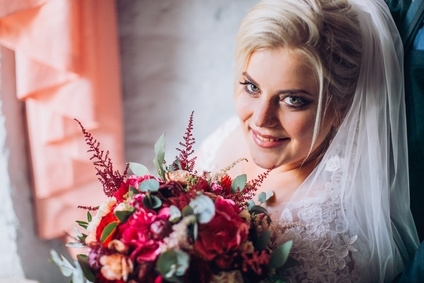 Every woman wants to look great on her wedding day, but if you are plus size you might be worried that your dream wedding dress won’t be available. The good news is that these days, more designers are taking plus size women into account when they put together collections, and with the option of a custom made dress or custom alterations you can ensure a perfect fit. Think about contacting the dress shop in advance to see if they may have samples in a helpful size for you to try on. Trying on potential wedding dresses should be fun so make sure you feel comfortable with the shop you have chosen. Think carefully about your materials – flimsy material such as chiffon doesn’t always work well on larger sizes while heavier materials drape better – and styles that will flatter your body shape. Pick a design that hides or takes attention away from any parts of your body that you don’t like – for example, if you don’t like your upper arms consider some short sleeves or a cape. But make the most of the parts you do like – the structured nature of many dresses with corset tops allows you to really accentuate your curves. Invest in some good underwear and wear it to your dress fittings. You could think about using control underwear but make sure you feel comfortable in it. If you are struggling to find a dress that you like off the rack, then opting for a custom made plus size wedding dress is a great choice. A custom made dress is a one-off piece designed to fit you exactly and can be tailored just the way you want, as well as giving you more flexibility when it comes to materials. If you are planning a Palmerston North wedding, there are some great venues in Palmerston North and the surrounding area to choose from. Whatever your style and whatever your budget you should be able to find something locally that will suit your plans for the big day. A unique business, The Herb Farm produces natural skincare products as well as acting as a beauty retreat and function venue. The stunning gardens are a great place for an outdoor wedding, but a marquee is available at short notice if Mother Nature doesn’t come to your party. The Farm’s chef can cater the reception and The Herb Farm also offers hen parties with the chance to take part in a workshop to make your own natural products. Designed in the Renaissance style with an ornate vaulted ceiling and a sweeping marble staircase – perfect for photo opportunities, The Regent on Broadway could be a good option if you are seeking a bit of glamour. You can even get married on the stage. Choose from the Tuiversity Conference Centre or the Flagon Room, a historic brick building with views of the iconic Tui Tower. And of course, Tui beer is included in the price of your venue hire. Caccia Birch House, originally built in1895, looks over the Hokowhitu Lagoon. Use the stunning gardens for a summer wedding or one of the beautiful rooms for an indoor ceremony. This venue offers flexible catering options and is really close to the CBD so handy if you want to move onto an after-party somewhere else. Wharerata has a dedicated wedding planner waiting to help you take care of every aspect of your big day from the cake to the seating plan. 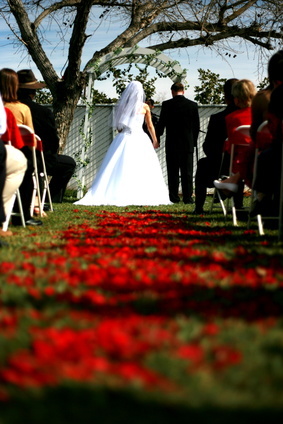 Weddings can take place outdoors in the sunken rose garden or inside the turn of the century homestead building. 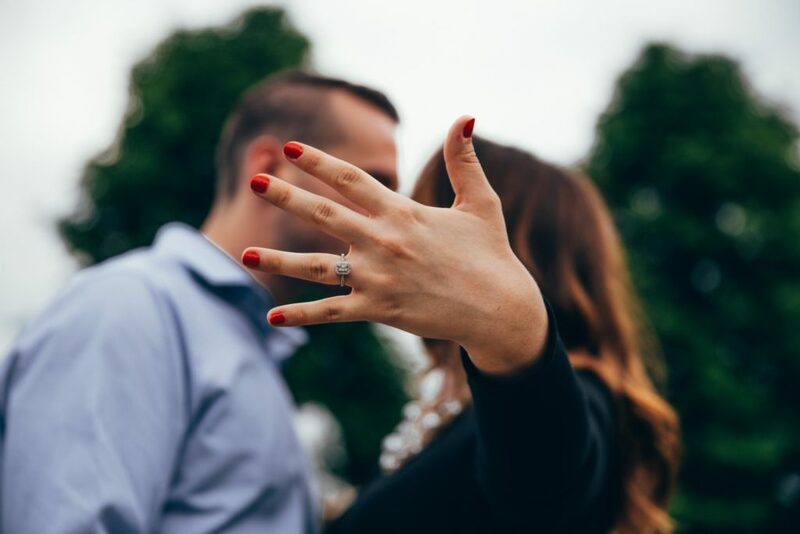 It can be useful to choose your Palmerston North wedding venue, as one of the first parts of your wedding plan because then you will not only be secure in knowing you have a place booked, but you can also tailor other parts of your wedding to match your chosen ceremony venue. For example, if you are having a simple outdoor summer wedding you might want to choose a shorter train or veil or even a shorter dress, while if you are getting married somewhere dramatic, you might want to pick a dress that will make a statement in the luxurious surroundings. Whatever you decide, we can help you find the perfect wedding dress to suit you and your venue. Contact us today to make an appointment. Dreaming of a white wedding dress? I love white, I love that it has become a tradition in New Zealand, and I want the typical dream of a fairy wedding including my puffy white dress and dream man. Getting married in white is so me, but I want my dress to be custom made, and have very strong opinions already on what it should look like. What is the history of the white wedding dress tradition? White used to symbolize status, and mainly in the western culture the amount of fabric used for a wedding dress was a reflection on the social standing of the family the bride was marrying into. Mary Queen of Scots married in white in the 1500s, which lead a surge towards white weddings but the trend became widespread in the 1800s after Queen Victoria Married Albert in a white lace dress. Brides everywhere started opting for white. I find the origins of the wedding bouquet fascinating, there are several different theories. The most popular understanding is that because in Victorian times baths were so uncommon and only happened once a year, the bridal party held bouquets of flowers to try and mask the smell of their unwashed bodies! I like the idea of the Greeks better; they used to bind flowers and plants together for garlands considering it nature’s gift to the bridal couple. Some say it started because brides carried herbs to ward off evil spirits, or up until recent times, brides carried garlic and dill. This originated from the Plague when the bride would hold herbs over her nose and mouth in order to survive. On a more positive note, I love the symbols associated with white. White stands for purity and innocence; it is associated with light, goodness and virginity. White often represents a successful beginning and it is the colour of perfection. In heraldry, white is a symbol of faith, something I want at my wedding. Some of the dresses below are among favourite styles, my one will of course be custom made using these as my muses. Many people say the most important item of clothing a woman will ever wear is her wedding dress. Whether the dress is lacy, sleeveless, backless, flowing or figure hugging it should be distinctive and personalized. I love it when the wedding dress has been tailor made for the bride ie a custom made wedding dress; it adds that special something to the entire ceremony. Having been to at least one wedding every week for the past few months (it really is the wedding season!) I’ve seen a quite a few unique wedding dresses recently. A good friend of mine got married last weekend, with a gorgeous ceremony. I’ve known my friend for the last 4 years; she didn’t want a traditional wedding, being a complete Tom Boy and feminist. The Bride and Groom are extreme nerds, loving Star Wars and taking Robin Hood to the ultimate as they are both into archery. What stood out to me, funnily enough was the dress: custom made wedding dress, bright green, the exact colour of her bow. This Maid Marion walked proudly down the aisle to The Imperial March in her bright green custom made dress! So off beat, the polar opposite to the traditional blushing bride, but that is what made the wedding special and unique to her. It was her day, and a beautiful way to express her personality. It was so refreshing to see an original style, altered perfectly to the design she wanted. It was flattering to her individual figure and she looked comfortable and stunning in her dress. The dress really did as they say make the wedding. Here at May’s Bridal and Fashion we want to give every woman that perfect dress, whether it is white, green, black or red. Using your wedding dress or any dress to make a bold and unique statement about you is easy. I’ve been enjoying reading Offbeatbride.com which celebrates doing things a little differently. It’s full of inspiring ideas for all different kinds of brides. Here at May’s Bridal & Fashion we really believe that every woman can look gorgeous on her wedding day with her own unique style. We want to help you find something that is just for you. After all, it’s for your special day. You can read the full article over there to see how she found the perfect dress. I think she looked gorgeous and her dress reflected her unique sense of style. We hope that you will find something wonderful just for you at May’s Bridal. We are also very happy to custom make your wedding dress. Some more reasons why a custom made wedding dress is great choice. You don’t have to suffer through trying on dress after dress at bridal boutiques. And, it doesn’t have to cost a fortune. Know what styles work on your body. Forget for a moment that you are buying a wedding dress, ask yourself : What kind of dresses looks good on your now. That is a place to start. I’m apple shaped, so I need a dress that makes me at least appear I have a waist. And I do have some good points that I like to highlight eg I do have a bust. You get the idea. What are your favourite features and how can they be highlighted and what parts would you like to minimize. I have one particular summer dress that I just love and I think look great in. And so I want my wedding dress to follows a similar style and look. Once you find a style you like, shop around for a seamstress. May is a wonderful streamstress with lots of experience. Come in and have a look at the quality of her work and have a chat about your needs. Bring in as many photos/pictures as possible to show garment construction, color, style, fabric, etc. May will probably have opinions about what fabric will work best for the look you are wanting. I would bring in my summer dress and have a chat about how that will look as a wedding dress plus some photos regarding other features I would like. I’m a big fan of purple and so I would like to incorporate that in my dress somehow. Turn it over to May and be honest with her. Be honest at the fittings and in your discussions, if you don’t like the way something is fitting, or the way things are heading , make sure you say so. You have to live with the dress and the pictures. If you don’t let May know what is not working for you, she can’t fix it. Have fun and look gorgeous. Feel pampered in your special dress! Designing your own wedding dress is awesome and I encourage everyone to look into it! Contact us today to have a chat or pop in to our store. It’s almost Valentine’s Day. As I approach it, I think about all the lovely romantic things my partner does for me and also the ways I can show him I love him. And I think about how we had a romantic wedding . Are you planning a romantic wedding? Planning something special for Valentine’s Day? Nothing could be more romantic that actually getting married on Valentine’s Day. Are you prepared for a gorgeous amazing lace design dream wedding dress? Check out the brand-new 2014 creations by May’s Bridal and Fashion? Our latest dress in our collection includes French lace and V style back and sweetheart neck line. It was designed by May Chen. Do you love a lace wedding dress as much as I do? You are in luck.. the collection can also be made to measure at May’s Bridal and Fashion for the prefect fit for every bride. May at May’s Bridal and Fashion keeps captivating elements in her dress design so you can look stunning.